Since 2003, we have rehomed more than 300 donkeys who live happily in their forever- homes in different locations in Spain. If you would like to join our Foster Scheme, please read the Terms and Conditions first (see file attachment below). Before making your decision to provide a home for donkeys, you may wish to discuss this with your veterinary surgeon and contact a farrier in your area to ensure you can obtain their services (we may be able to help you find a vet and farrier). 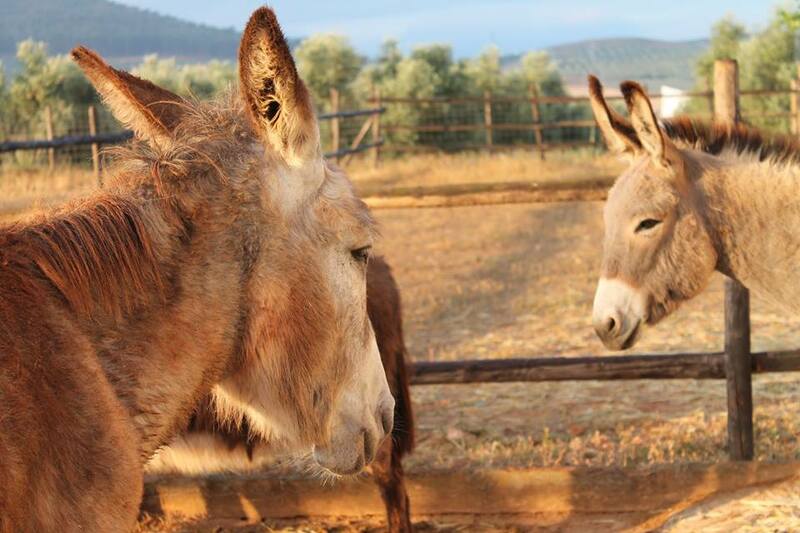 You may also want to carry out an overview of the costs involved in caring for donkeys. An approximate guide to the Cost of Keeping a Donkey is on our website. Donkeys are very sociable creatures and make fantastic pets! By giving two donkeys a loving, caring home we are sure you will be amply rewarded! Everything you ever needed to know! Donkeys are fantastic! They just love individual care and attention and will reward you with affection by the bucket load! Mind you they do form strong bonds so we always send them out in pairs. A minimum of 250sqm of grazing/land is required. The actual amount of land required will vary dependant on the type of terrain, soil, drainage and climate and so the Donkey Welfare Adviser will discuss this with you. A hard standing area - donkey's feet are really porous so they need to be able to get off the soggy ground when it's really wet. Strong stockproof fencing is also a must as donkeys are great escape artists! We also advise to get in touch with the local authorities to find out which licences are necessary in the area in order to build and which are the legal requirements to have equines. My horse is looking for a friend - can you help? Our donkeys are already bonded so don't need another equine friend and will also get upset if the horse goes out riding without them! Please house your horse or pony separately although they could say hi over the fence! I have a lonely donkey, should I get another one? Yes! Donkeys will be very lonely otherwise. We will do our best to provide a single donkey as a companion to your own but will need to chat through all the details with you first, so just call us. I don't have a stable or shelter, is this a problem? Donkeys don't have waterproof coats like horses and will always need access to a shelter or stable, it also provides shade from the sun on long summer days. But don't worry if you haven't got one yet, our team can advise you. Donkeys are very sociable and would love you to spend as much time as you can with them! We recommend visiting the donkeys to check they are OK and have food and water twice a day generally make a fuss of them! We also recommend that you check them for injuries, pick out feet, groom, muck out each day. You may even be the talk of the village by taking them out for walks! But I don't know much about donkey care! Come to our sanctuary for free training and information! Support and advice is always available from us too, we are here to help! And we will give you training on donkey care before delivering the donkeys to your home. Can I choose which donkey I want? Time will be taken to match you and your donkeys, so you can have long and happy lives together. If you like a challenge and have some equine experience, we have many donkeys that may need a little extra care and attention, so do let us know what you have in mind. Can I breed from foster donkeys? As we rescue so many donkeys, we already have a lot to care for! We therefore have a non-breeding policy which also covers our foster donkeys. We would be delighted to talk to you about the Foster Scheme and answer any questions you may have and send you an application form. Don't hesitate to call our office Monday to Friday on (00 34) 952 735 077 and we will put you in contact with our Welfare Officer. You can also apply online to foster donkeys. We will visit you in your home and give you advice on what you will need. We can also arrange for you to come to el Refugio for training and once accepted, we will find the donkeys most suited for you. By giving donkeys a loving, caring home we promise you will soon find out what lovely characters they are and superb company to have around!